Tonight I’ll turn the few ripe ones into a Classic Tomato Pie. Meanwhile, I’ll place the green ones, single layer, into brown paper bags, where they will fully ripen in 2 week’s time. (This paper-bag-ripening-method has never failed me.) Then they’ll be good for Lazy Sunday Tomato Sauce, which I like to freeze for winter use. I wonder — are you still harvesting tomatoes? Or has frost finished the vines off? I just picked the last bowlful of cherry tomatoes and canned the bigger tomatoes I picked off my fallen trellis 3 weeks ago. All I have left out there is a bit of spinach and some carrots that I planted last month. Terry – I remember your milk-crates of tomatoes! Did you let them ripen first…or did you can them in the green stage? I'll dig up potatoes tomorrow…then there are green beans, carrots, and Brussels sprouts awaiting their harvest-turn. I let them ripen first and made sauce from 32 today, there are some ripening still. 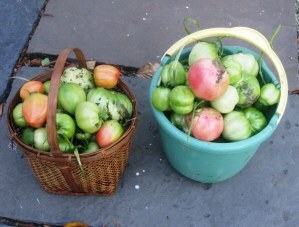 I harvested the rest of my tomatoes on Saturday too! Just in time for the temperature dive! Terry – What is your indoor-ripening procedure? Paper bags — like mine? Or do you just lay the tomatoes out on a table or counter? Kevin I have been converting a front hall closet into a pantry and I put some of the tomatoes in large shoe boxes in the pantry/closet. Some were laid out on shelves in there. Some are still in a milk crate. Come winter that closet gets quite cold, that's why I have converted it to a pantry – to store my butternuts and potatoes and other foods. I have a ton of green tomatoes I just harvested this afternoon. Just lay them in paper bags…in the dark? in a sunny spot – does it matter? Leslie – Set the bagged tomatoes in a dark, and preferably cool place. Sunlight (and heat) will cause them to rot, not ripen. Thanks Kevin – looking forward to a bumper crop and my first adventure in canning! Leslie – Best of luck with those tomatoes. We'd love to hear about your first canning adventure!